The handle is comfortable in a great deal of grips.That is including the ice pick grip, but that is probably not the norm considering the fact that my hands are very tough. You can also choke up on the knife. The 3/4th of an in before the blade provides a good place to a finger. Cold Steel’s upcoming models may benefit from recessing that section out a tinny bit to make it a real place for the finger, providing yet another grip, this one with fantastic blade control while carving. The oversize, semi-hooked scull crusher was great for securely deploying the knife, wave style, and has also good for crushing nuts, but it will not break car glass. The aluminum is not hard enough. The steel was fine. I have no complaints there.I wasn’t anything special. I touched it up once or twice a weak. 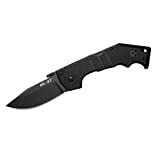 For a very aggressive tactical blade it worked perfectly, but presses into a super hard use survival blade of this knife performed more than adamantly. The belly was awesome for slicing and carving. The wide blade made it good to grasp for chopping veggies and made the knife a good spreader of butter and such. The point started divots for bow drills nicely. The blade shape and the wave feature is really what I fell in love with and is what made me choose this over the American lawman … so much belly. I did end up breaking the tip off, though. But that could have been expected with what I was doing (processing some exceedingly tough, fairly untreated oak. I was applying an enormous amount of lateral pressure to that tip, which snapped about half an inch down the blade) The blade did not bend, it just snapped! I have snapped tips in the past and those deformed slightly. This blade steel and geometry just aren’t that strong. I ground off the upper portion of the blade to keep it from cutting my pants. All in all, this knife rocked. My only two gripes are the blade geometry (flat ground would have been a stronger choice for the World’s Strongest, Sharpest Knives) and the inside of the handle scales were sharp and uncomfortable on the inside of my fingers from time to time. With that being said, even though the knife broke, I will be purchasing a new one inn the future. Thanks for reading. Thanks for leaving your detailed assessment of the AK-47 here. Sounds like you have had a great deal of pocket time (and real world use) with the knife and I want to thank you again for taking the time out to put this together. I know I found it useful, so I am sure others will find it valuable as well. No problem dude. I know that I don’t know everything, but i am always willing to share what i do know. I hope this review, which i was sitting on for some time, gets as warm a reception in Blade Forums. BTW this was a 2012 model. Thanks again, John. Take care.